Cedar Grove Farm, established in 1838, like many farms in this area, did not thrive as do farms where the land is rich and productive. Its best years were the 19th century before the invention of cars and refrigeration. Before the advent of the automobile, hay was particularly suited to the soils here, and the farmers shipped hay on the local train to cities full of carriage and work horses. Small dairies were also prevalent in this area. In winter, men turned to Sawmill Bay and other rivers and bays, where with horses, ice was cut from the water, hauled to local ice houses and packed with saw dust. Eventually the ice was shipped by local trains, to provide ‘refrigeration’ in ice boxes to preserve food. These jobs, as well as limestone quarries, lumbering, and shipbuilding provided a living for local inhabitants. The farm in the 20th century, was diverse, with chickens, pigs, horses, ponies, guinea hens, ducks, geese, chickens, cats, and dogs. In the 1920’s to 1950’s the farm had a dairy herd of Ayrshire cows. Due to the health of his father, Lyle Warner took over the farm at 14 years of age. Often, he had a Jersey cow as well as his Ayrshires. After the large dairy barn and attached hay barns burned in 1955, hay and chickens were the sources of income at Cedar Grove. Today, Cedar Grove is again thriving and celebrating its history, this time with our new winery, and with animals given a second chance as they are retired to this safe haven. In 2010 Cedar Grove Farm became a bird sanctuary under a NYS DEC program, and our grassland birds now enjoy farming practices which support their nesting & foraging needs. In 2014 the first vineyard was planted at the northwest portion of this 178-acre farm. It is located next to a small pond, with a grove of trees nearby. Bill Will was one of the first rescues to come to the farm. He is a flat racer, one of thousands of thoroughbreds discarded after they have been on the race tracks at very young ages; Bill is a white horse flecked with grey. He will eventually turn pure white. Bill Will raced in Maryland, and was born in Florida. Sometimes you will see him flying across the fields. He is the alpha horse, directing where the animals graze. Guinness sometimes appears in local ads for White Caps Winery. Guinness is a guard dog with ancient lineage. Anatolian Shepherds were reportedly brought to the US in the 1970’s, but their transfer has been difficult. Bred to live independently to guard sheep in the mountains of Turkey from predators such as mountain lions and bears, these highly intelligent working dogs must be socialized very early in order to successfully exist as family pets. Guinness was adopted at the age of 5, saved only an hour, from being euthanized because his family no longer wanted him. He is a warm loving dog, and strives to be by the side of his owner as much as possible. Beware, Guinness finds any food within his reach fair game! Clarissa came to Cedar Grove Farm in the fall of 2018. 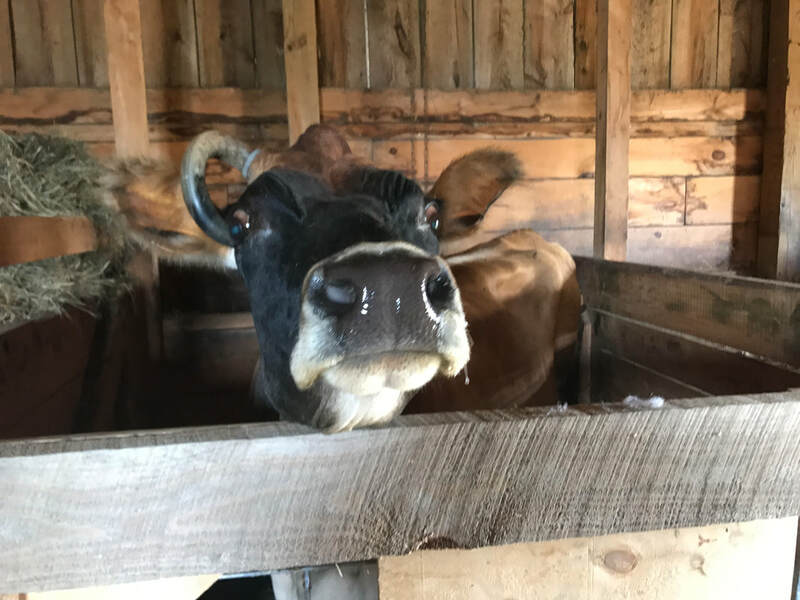 Clarissa, a Jersey Cow, was no longer able to provide milk as part of an organic dairy. This farmer decided to “retire” Clarissa, rather than sell her for meat. She’s a very fortunate cow! Clarissa loves people and is very friendly. She’s a great ambassador at our farm, looking forward to meeting guests from White Caps Winery when they walk the trails. Clarissa loves apples, carrots and sweet feed as treats. If cows could smile, she would when she sees you! When you speak to her, she knows her name! Okie the donkey, came to the farm in 2017. He was rescued from a kill pen in Oklahoma, shortly after he was born and his mother died; he’s named after the state where he was found. Okie has gained 50 pounds and matured from a tiny submissive baby when he arrived, to an assertive member of our herd. He could live to be 40 years old, the life expectancy of his species. Donkeys are used around the world as pack animals. Sure-footed and very intelligent, Okie enjoys treats and meeting guests. He’s so loveable! From a distance, Okie resembles a giant rabbit! Don’t underestimate this fellow. When he first arrived at Cedar Grove, he set other animals in their place, with well-placed kicks, even at Bill Will, the alpha horse. Donkeys also defend against coyotes. Cowboy, so named because he originated in the West, was probably discarded as a cow pony due to his age. In 2018 when he arrived, his age was estimated at 18. He is a sorrel color. Cowboy is a kind and gentle horse, amiable with people, and loves attention. He rides western, and enjoys being part of the local herd at Cedar Grove Farm. He loves apples as a treat and sticks close to other horses on the farm. Hershey is a mini-pony. He stands only about 8.3 hands, a standard equine measurement where a hand equals 4 inches. When rescued from a kill pen, Hershey was expected to remain the color of a Hershey chocolate bar, but in time became a lighter color, commonly known as sorrel. Hershey has a wonderful temperament but will search your pockets if he thinks you have a hidden treat! (He’s partial to apples.) Hershey arrived at the farm in 2017.